Subscription under Dussehra Diwali Offer Closes Today! We are pleased to inform you that we have received an overwhelming response from our readers towards our Saral Gyan Dussehra Diwali Offer which will close today on 25th October at 11.59 PM. Since 2010, Saral Gyan team has successfully published hundreds of articles providing insight to equity market and today cherish association of more than 38,000 readers. Articles published on our website received lot of appreciation as it helped our readers to make educated and smart investment decisions based on facts. During past 7 years, we launched suitable services to help Investors to create wealth by investing in Indian stock market. Its appreciation and support of our readers that one of our most admired service - Hidden Gems ranks on top not only in performance but also on Google search engine. Try it out yourself by searching or "Multibagger Hidden Gem Stocks" or "Unexplored Multibaggers" on Google, you will find our website www.saralgyan.in featuring on top in search results. Its your appreciation and word of mouth publicity which make our website featuring on 1st position in Google. 1. Hidden Gems (Unexplored Multibagger Small Cap Stocks): Based on fundamental analysis, our equity analysts release one Hidden Gem research report every month with buy recommendation and share it with all Hidden Gems members. Stock finalized as Hidden Gem belongs to small / micro caps space with market cap of less than 500 Crores, expected returns from Hidden Gems is above 100% in period of 12 - 24 months. Once target is achieved, we inform our members whether they should continue to hold the stock or need to do partial / full profit booking. If fundamentals are intact and valuations are reasonable, we suggest to continue to hold the stock for long term for multibagger returns. Annual subscription charge of Hidden Gems is INR 10,000 under which you will receive total 12 Hidden Gems research reports (one on monthly basis). Click here to read more about Hidden Gems. 2. Value Picks (Mid Caps with Plenty of Upside Potential): Our equity analysts team consider Warren Buffet approach to short list stocks from mid cap segment as Value Picks. Market cap of Value Pick will range from 1000 crores to 10,000 crores. Holding period of Value Picks is 12 - 24 months and one can expect returns of 40-50%. Annual subscription charge of Value Picks is INR 6,000 under which you will receive total 12 Value Picks research reports (one on monthly basis). Click here to read more about Value Picks. 4. Wealth-Builder (An Offline Portfolio Management Service): Wealth-Builder is our model portfolio of Rs. 10 lakhs and currently we are holding 16 stocks in our portfolio. We suggest higher allocation in our Wealth-Builder stocks which includes best of our Hidden Gems and Value Picks released during last couple of years. Our team suggest all our Wealth-Builder members to invest in the stocks which are part of our Wealth-Builder portfolio. Every month our team updates our Wealth-Builder members which stocks they need to buy / sell / hold with % allocation of these stocks in their portfolio, the suggested changes need to be replicated in the same proportion. Annual subscription charge of Wealth-Builder is INR 20,000 under which you will receive total 12-18 portfolio updates. We also review existing equity portfolio of our members and advise them which stocks to hold and which to exit based of fundamental analysis under Wealth-Builder service. Our Wealth-Builder service is suitable for those investors who have an existing portfolio of at least 2 to 3 lakhs or planning to invest similar amount or more in equity market. Click here to read more about Wealth-Builder. 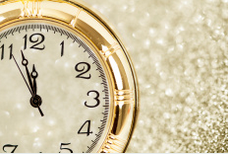 Time has shown that smart investors have made their fortune by investing in equities in long term. None other asset class can match giving you such extra ordinary returns. Yes, its important for you to invest in right set of companies at right price. Remember, "If you want your Money to Grow, Equities is the only Way to Go" in long term. If you think to invest in stocks for period of 3 months or 6 months, we suggest you to stay out of stock market because you are not investing, you are betting on volatility of stock market which could be risky. Its our mission to ensure that you reap the best returns on your investment, our objective is not only to grow your investments at a healthy rate but also to protect your capital during market downturns. We also take this as an opportunity to share the returns on investment given by one of our most admired service Hidden Gems during last 7 years. Hidden Gems (Unexplored Multibagger Small Cap Stocks) continue to shine giving average returns of whopping 281% to our Hidden Gems subscribers compared to 90% returns of small cap index during last 7 years. We are glad to inform you that 46 Hidden Gems out of 64 (released till Dec'16) have given more than 100% returns to our members during last 7 years. 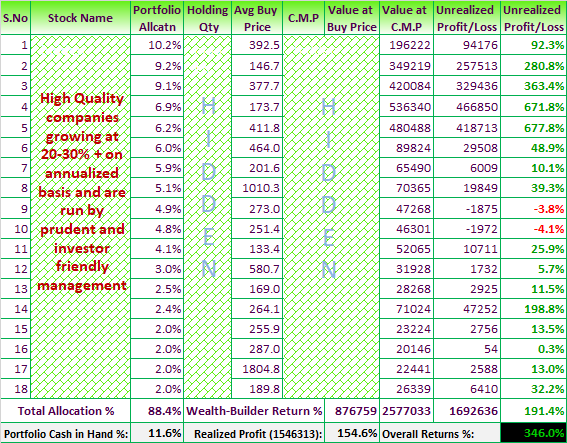 Moreover, 34 stocks out of these 46 have given returns in the range of 200% to 2000% during the same period. We are confident that we will continue to hunt best of Hidden Gems & Value Picks from universe of small and mid caps by doing authentic, in-depth and unbiased research work and support our members to make educated investment decision. Through Hidden Gems and Value Picks, we're providing you opportunities to invest in such small / mid caps stocks today. Infosys, Pantaloon, Bajaj Finance, Glenmark were the small cap stocks in past and today are the well known companies falling under mid and large cap space. Moreover, under our Wealth-Builder service, we encourage our members to replicate our Wealth-Builder portfolio by investing in selective high quality small and mid cap companies. These companies are reporting 20-30% + annualized growth and got their due share of re-rating and delivered exceptional returns to our members so far. Since 1st Jan 2013, Nifty has given returns of 70.9%, Sensex returns is 65.6% where as Wealth-Builder portfolio has given returns of 346% returns to our members. In case you have not yet started building a portfolio of high quality and fundamentally strong growth stocks for long term wealth creation, please find below the Wealth-Builder portfolio allocation & performance update for your reference. Now you can add power to your equity portfolio by investing in best of small & mid cap stocks - Hidden Gems & Value Picks. Enjoy great savings and receive valuable freebies under Dussehra Diwali Offer of the Year by availing subscription of our Hidden Gems, Value Picks & Wealth-Builder services. Do not miss out Saral Gyan Dussehra Diwali offer, an opportunity to avail subscription at best discounted price. Hurry! Last few hours left... Offer will disappear today at 11.59 pm.